On a bright yellow day in new-minted May, my phys ed class and I are out for a walk. The class is actually called Mind and Motion, with some idea that the two go together. The small urban high school where I teach has no athletic facilities—no courts, no playing fields, no weight room. The cityscape is our gym and walking is our exercise. We’ve survived a winter of shrilling wind and unrelenting snow, and a slow-to-arrive spring, but the days are melting toward change, so on good afternoons we go out. I like a quick pace, to give a bigger reward to the efforts, but these kids are stragglers—in school; in life. For all seventeen, eighteen years of their existences, this city has been their home, but what they don’t know about it amazes me. Yeah, something about textile mills, birthplace of the American Industrial Revolution—they can quote the phrases by rote (all those field trips in the lower grades), but they lack a sense of what all that means in real lives. They’re busy texting friends to arrange after-school meet-ups, a fight going down here, a party there, some bomb ’dro to blaze at Kerouac Park. They’re watching car and skate videos on their phones, updating statuses on Facebook . . . there’s so much they know of the intimacy of their own existence, but almost nothing of the city around them, with its two centuries of history. 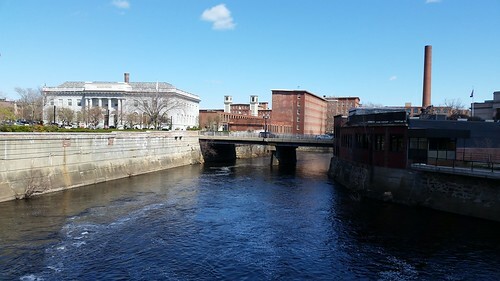 Most can name the big river that flows through it—the Merrimack—but stumble on the other, smaller river, the Concord, which converges with the first. They don’t know about the Thoreau brothers’ 1839 trip on these waters, which their phones could tell them everything about in an instant but won’t because they don’t know enough to ask. And that’s where we are now, making our way across a bridge on the Concord River, me at the head of the pack. Which is when I see it. I have to look twice to be sure. Coming down the river is a snowman. A snowman! One of those big soft fabric figures, lying on its side, but easily seven feet tall and hefty. It is formed of three white spheres of fiber-filled textile and it’s bobbing along on the spring flood. “Check it out,” I say. A few of the students pause to look; most don’t break stride. They’ve seen all manner of things in the river—shopping carts, basketballs, bicycles, baby carriages, even the occasional corpse. This is just one more bit of flotsam. I’m at the bridge rail, marking the snowman’s progress. It’s wearing a plaid holiday scarf and a top hat. In a sudden whirl of current it rolls onto its back, and I see its face now: a carrot nose and a frozen smile. Not for the first time I rue the old flip phone clamped to my belt with its useless camera. The students all have iPhones, with good cameras, but they see no photo op. They’re happy for the pause, however: a moment to stand in the sun and talk. Some would gladly light up cigarettes if I allowed it. Spark dutchies. A student makes a joke. “What’s the difference between a snowman and snowwoman?” He waits a beat, says, “Snowballs,” enjoys the laughter. But it has spooked me, this appearance of the snowperson, a full five months since the holidays—like Christmas on the semi-annual plan. As it nears the bridge, I’m full of questions. Where did it come from? Who does it belong to? How has it come to be there? Where’s it been since New Year’s? Was it a natural death or a crime, a prank gone sinister or worse, the work of holiday haters, like those Halloween witches you see, broomstick driven into a tree? And if he were to merit an obituary, what would it say? He’d weathered the snowiest Boston winter on record? I imagine answers: a holiday leftover, freed somehow from a lawn display and washed by vernal runoff—or, horrors! tossed—into the river. The nap of its fabric is soiled, tattered, and yet it rides with surprising buoyancy, almost jauntily, its fabric carrot nose up-thrust like a small mast, moving along without panic or plan. All I can do is speculate as it nears the bridge and will shortly pass thirty feet beneath me and soon thereafter merge with the big river. What perilous act or misadventure sent it on this lonely liquid journey? Or was it the final act of a desperate snowperson, tired of its thankless task, determined to slip secretly away, to take its chances with the kindness (or cruelty) of strangers? It is near now, a dingy shade of pale against the churning, mineral-dark riverrun. The festive scarf, I discover, is actually a long greenish-brown frond of aquatic weed. Worse, the snowman is not moving with the caprice of a spring wind as I’d first thought. No, his is a sodden, dolorous downriver journey that cannot end well. Did a family fail to be its steward? Was it a victim of kidnappers? My students are already over the bridge and waiting, docile as cattle, on the other side. Not one looks back; not one looks at a photo of the snowman because no one took any. Why would they? Their generation has substituted narcissism for self-knowledge. Accustomed to illusion, unencumbered by history, they float on their own transitory and, ultimately, solitary journeys. Though am I so different? No longer concerned for the how, I probe for the why, some metaphor in this ghostly visitation from Christmas Past, this Nowhere Man of the North. In an ideal educational world one could find something to put a bit of the cerebral—transcendental even—into Mind and Motion. I could ask them where they think this neither wholly nor unholy Christian symbol, part pagan and part Norse, has been on its pilgrimage. Fleeting Frosty, ephemeral evangelist of evanescence . . . whither, ghost, goest? Where hast thou been on your watery way, your pilgrimage and peregrinations? What, pray, hast thou found? But time is the enemy of us all. The snowman is going under the bridge, rolling once more in boneless bonhomie, flashing its frozen friendly face and cordial carrot nose—would it tip its top hat if it were not sewn on?—then gone, farewell, adieu, later bro. to Plum Island and the oblivion of the sea, the eventual portion of us all. I could not read this quickly—though I was eager to seize the next pearl of diction—because, like his narrator, I wanted to linger, ponder, savor. As each idea ambled into my consciousness, Dave’s customary admixture of vibrant imagery, familiarity (I teach high school English), and union with felt-but-not-seen forces drew me to this typical, nay, inexorable, conclusion: Damn! He’s good. Great imagery. I can actually see him/her floating toward the sea. This is great, Dave Daniel! A terrific read…thank you, Dave Daniel!